With Our Indoor Air Quality Testing & Duct Cleaning Services! Indoor air quality can be an aspect of the home or place of work that many people can tend to ignore. It's not easy to detect until the condition get extraordinarily bad or a distinct odor is continuously spread throughout the building. The indoor dryer vents and other ventilation systems in your property are the devices responsible for ensuring your air supply is clean and maintained at a healthy freshness. Over time your HVAC units and air ducts will handle a lot of moisture and various forms of dirt. If these instruments are not cleaned regularly, this combination of dirt, grease, moist air and bacteria can develop into mold growth. Mold releases spores, odors and can create foul stains that prove impossibly hard to remove. Many parts in your air duct and ventilation systems will degrade and break over time. Filters for example, play a vital role. They clear the air of minute dirt particles and ensure the air is kept as clean as possible. Filters don't last forever. Over time the dirt will build on them until they are severely blocked. We can provide air duct maintenance and replacement parts to ensure your HVAC units are working as effectively as possible. 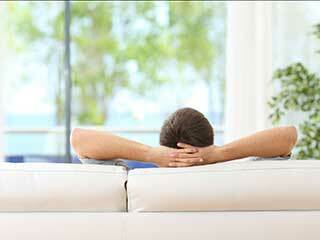 One clean can mean a huge improvement in your indoor air quality for years to come. The exhaust systems in your kitchen and bathroom handle a lot work. If you cook a lot, the air that is collected from your kitchen will be filled with smoke, grease, moisture and warmth. These are the perfect combination of substances to create some of the very toughest stain imaginable. You'll probably notice large black and amber marks stretching right across the face of many surfaces around the exhaust. We can have your entire exhaust system cleaned to near perfection. Call us today if you think your vents and HVAC units could use a deep and thorough professional clean. We can come at a time that suits you to assess your air pollutions levels before and after we have completed our processes. This is the best way to appreciate the impact we’ve made.